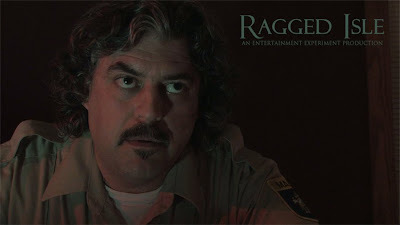 Just finished compiling images for each of our cast members for the raggedisle.com website redesign. What a wonderful mix of faces. 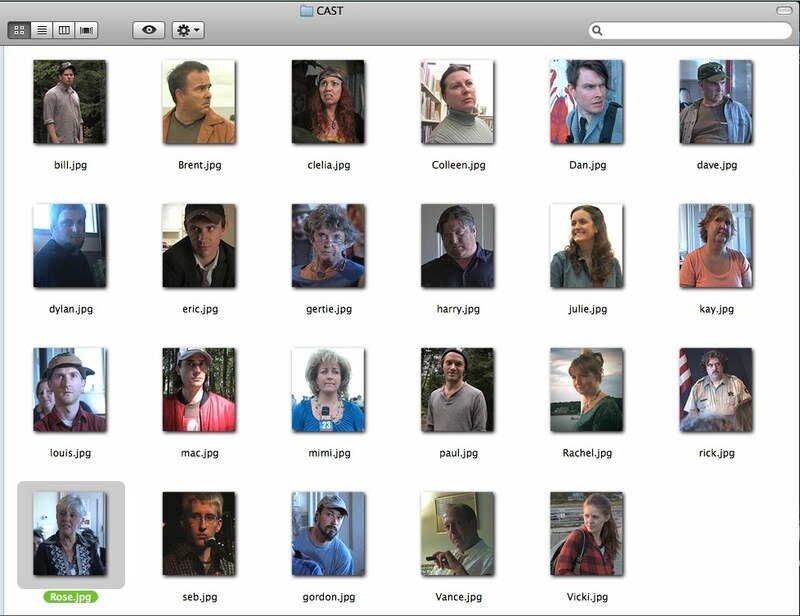 Seeing them all together in my finder window gave me goosebumps! There is a ton of talent on display right there. We are lucky to have them inhabiting our island. 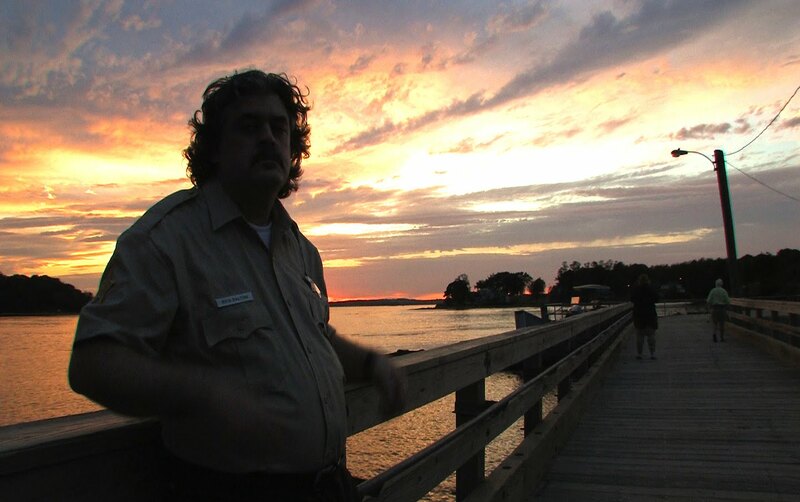 Sheriff Rick Dalton waiting by the Ragged Isle ferry docks while the sun sets into the sea. Random image of the day is back! Captain Paul, Eric, Dirty Bill and Mac pulled their traps and made a beautiful tree on Ragged Isle. Happy Holidays to all the people who work the sea and the ones back home who love them. Our first press is out today! Here's our very first news story on Ragged Isle. 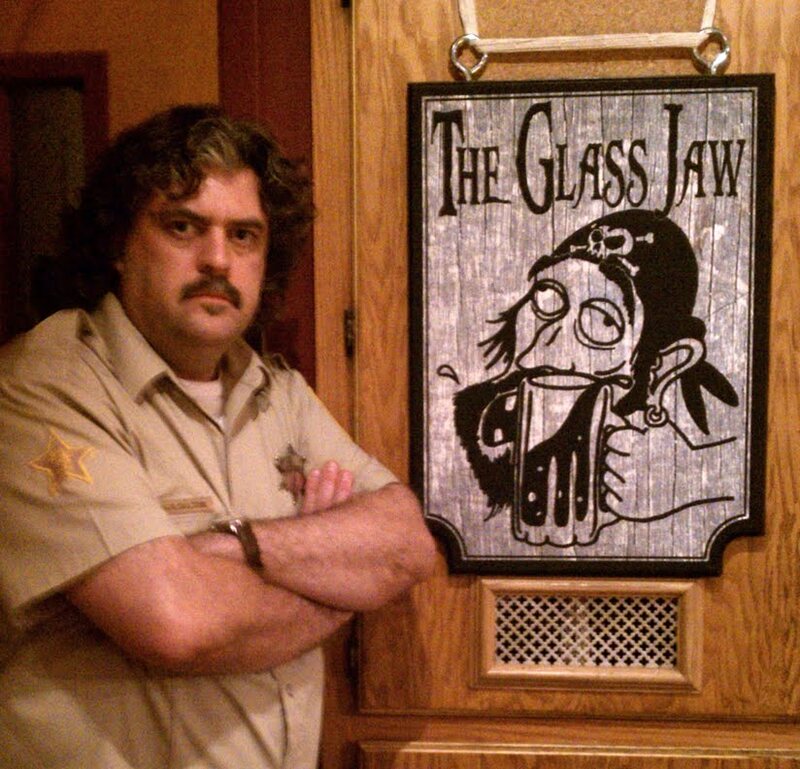 It comes courtesy of local indie film writer Dennis Perkins of the Portland Press Herald. We talked for about an hour and I had no idea how someone could turn that stuff into a story. Turns out Dennis is a pro and I had nothing to be worried about. 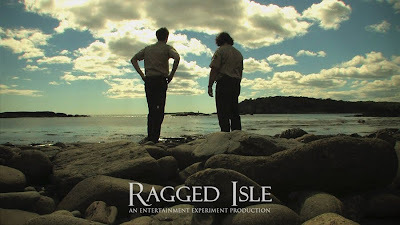 It's no mystery that an enormous effort by many folks who go unnamed in the article are the reason why Ragged Isle looks as good as it does and will deliver thrills and chill to our audience. Hopefully next time I get to talk more about all of them. For now though, enjoy! PS, Dennis mentions that our first episode comes out at the end of January. It's actually more like the end of February. 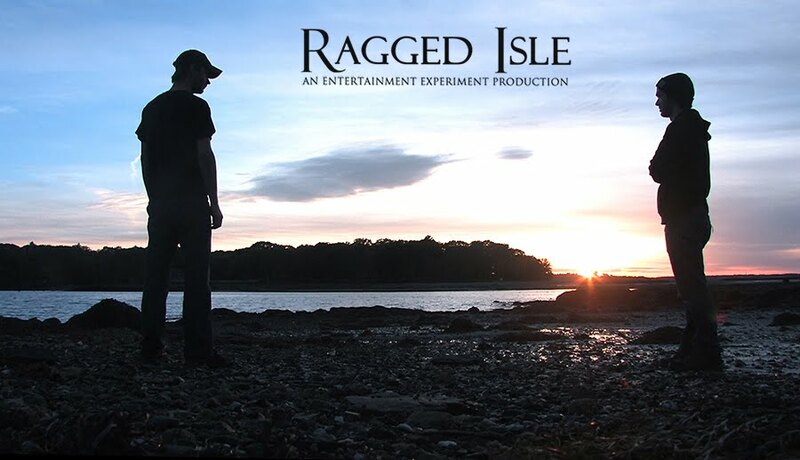 Ragged Isle's first real press! I had the pleasure to speak with Portland Press Herald columnist Dennis Perkins today for a bit about our little web series. He had seen our trailer and wanted to do a story about it to get the early word out there. Cool huh? I thought so. I was very VERY nervous to say the least. He was gentle though and I thank him so much for showing an interest this early on. I hope I represented us well. Honestly, I don't know if I said anything of any use but I did talk. I do remember talking. It was at least enough that he said he'd like to do a follow up interview when we are ready to unleash the beast. I know what you're thinking, when is it coming out in the paper? It was such a blur I can't recall when he said. No worries though. I've got an email in to him and when he reminds me, I'll update the blog accordingly. 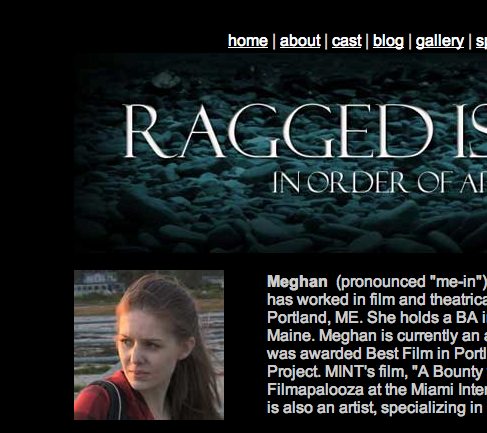 working on the update to www.raggedisle.com ... here's a screen-cap of the new gallery page! 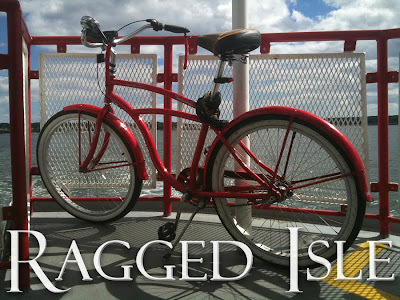 A popular mode of transportation on Ragged Isle. Another scenic image from the waters of Ragged Isle. 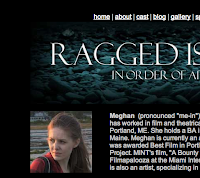 I am working on some stuff for the ol' interwebs, and would like to add your preferred head shots to the site on the "CAST" page. I figured I would try asking on the blog first, since I know you all read it, every day. I have a few placeholders now, and we can try to pull screen grabs, but if you have a shot you'd really like to see up there, please send it along! 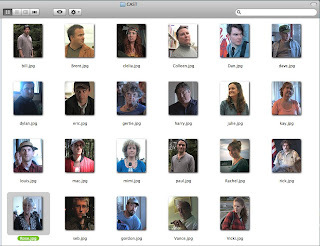 As of right now the head shots will be 200 pixels by 200 pixels. If that helps any of you. 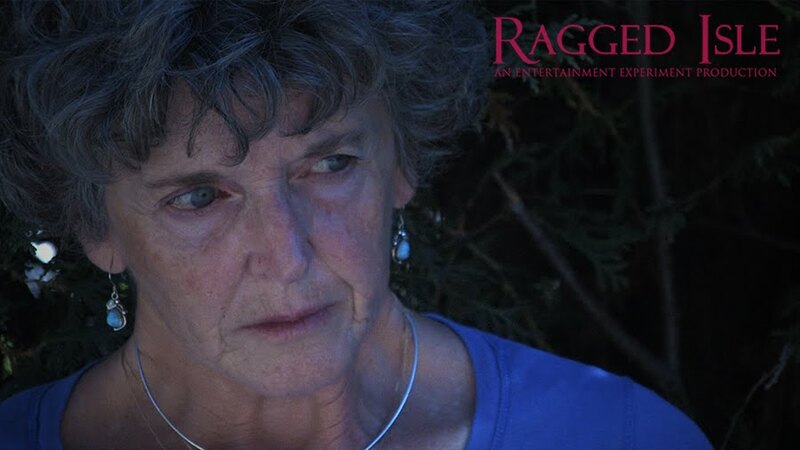 Behind the scenes with director Barry Dodd and assistant director Karen Dodd. I've got good news. There is a rough cut for 8 of the 10 season one episodes of Ragged Isle. Hoping to get at least one more done before the weekend is through. It's looking like we've got ourselves a full fledged series on our hands folks. Happy Birthday to Ragged Isle's own Sheriff Rick Dalton! 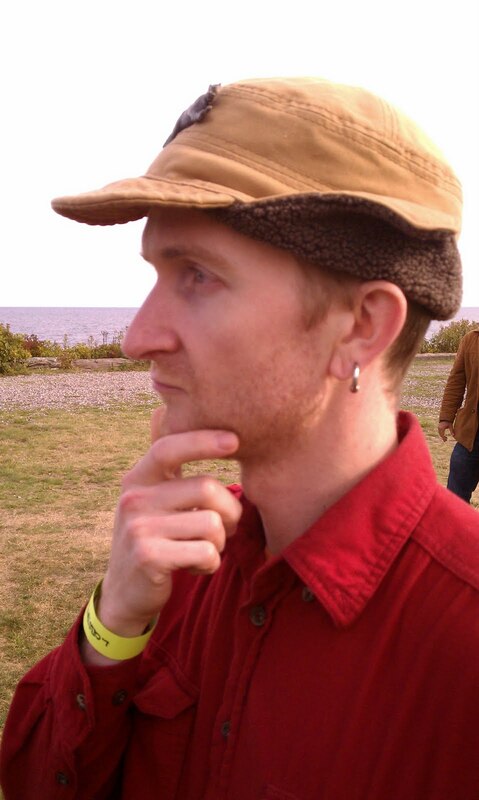 Happy Birthday Derek! You don't look a day over 16. Must be something in the water. These random images have really got me going! It was a blast to write Ragged Isle last winter - I don't know how it worked, but, boy, did it. Barry's drive, Rick's passion, Karen's realism, Greg's tireless efforts and effortless dialog, and my ... well, i was there too, OK. ANYway. Where was I? Oh yeah. The random images. The latest of Rick inspired me to have a little fun, and to warm up for what's to come! The Ragged Isle Season One Trailer is online! The wait is over. Turn on your good speakers, and crank it up. 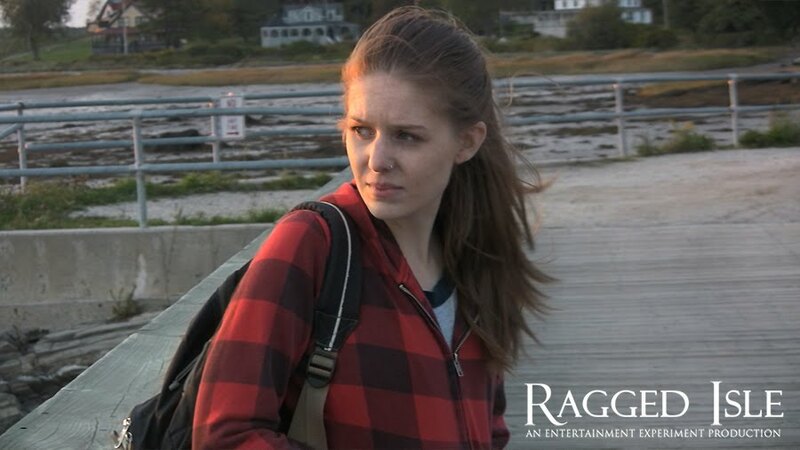 Vicki Burke has just landed her dream job on the quiet Maine Island of Ragged Isle. Soon, she will be caught in a web of intrigue, suspense and murder. Who can she trust when everyone is a stranger? The cat is out of the bag tonight! One quiet goal I had for myself was once we reached 200 fans on facebook I would have a new trailer done. Well, it looks like we're 9 people shy of 200. Maybe we'll tip the scale after the special preview tonight! 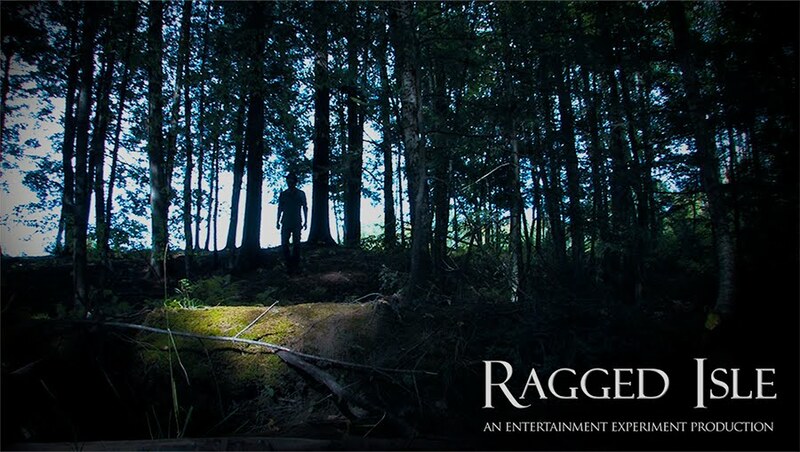 Tomorrow, I'll share the trailer with the rest of the world. Hoo-Boy! I've secured something rather special and unexpected for our new teaser. 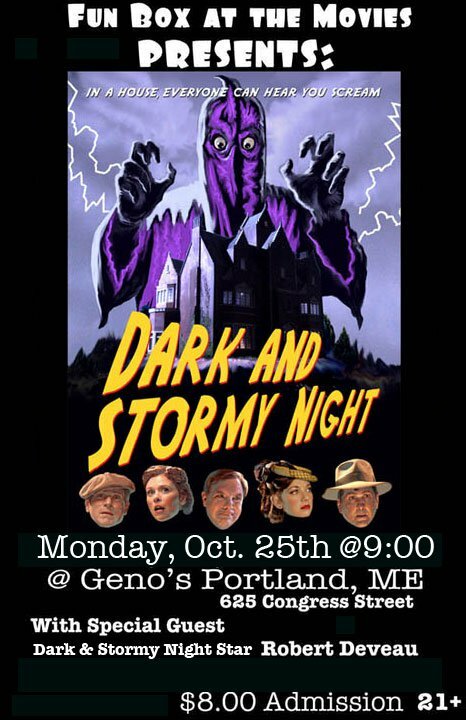 Friend of Ragged Isle, Tristan Gallagher shows cult movies every Monday night in Portland and he was kind enough to let us premier our trailer before the showing of Dark and Stormy Night tomorrow. This will be extra special because it's being shown at Geno's Rock Club where we actually shot one of our episodes. 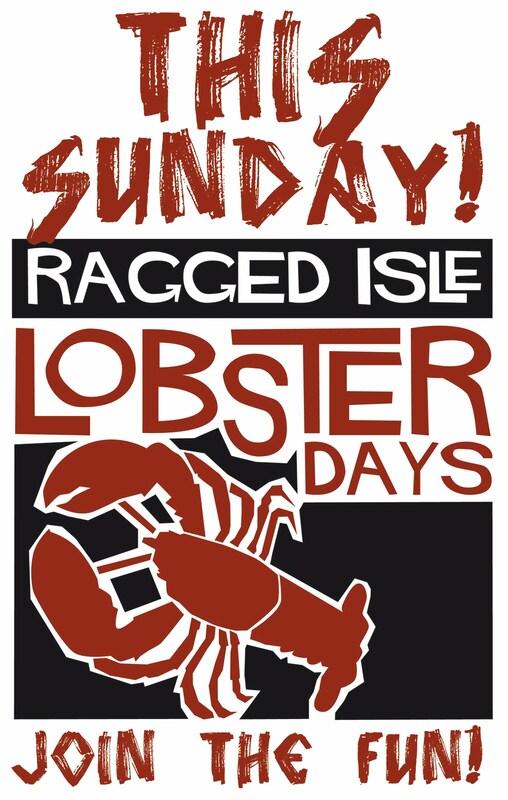 I believe there is still a flyer hanging up in there for Lobster days! So, I'm sorry to say that if you can't make it Monday night, you'll have to wait until shortly after to see this first true glimpse at the production. For those of you brave enough to make the journey, it'll be worth it! The feature is produced by the same troupe that made Lost Skeleton of Cadavra which is one of my all time favorite comedies. Plus, Robert Deveau one of the stars of the film will be on hand. Maybe some of the Ragged Isle stars will be on hand tomorrow too! One can only hope. Karen and I will be there. Stop by and say hello. 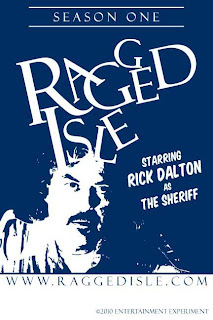 We'll be the ones in the Ragged Isle shirts. Which just happen to have been silkscreened by Tristan Gallagher as well! Last night, I attended a very cool double-feature of short films directed by the supremely talented (sometime "Ragged Isle" cinematographer) Derek Kimball. 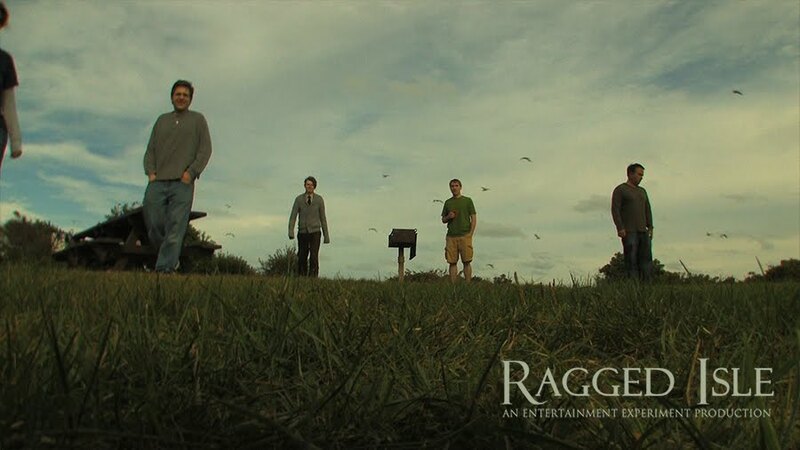 Those in attendance included "Ragged Isle" director Barry Dodd, "Ragged Isle" actors Rick Dalton, April Purinton, Erik Moody, Meghan Benton, and Michael Dix Thomas, and two-time "Ragged Isle" extra Torrey Ham. Seeing all these folks in one place made me realize how much I missed this summer's weekly-plus "Ragged Isle" shoots, and how much I appreciate being even a small part of a vibrant and creative local arts community. 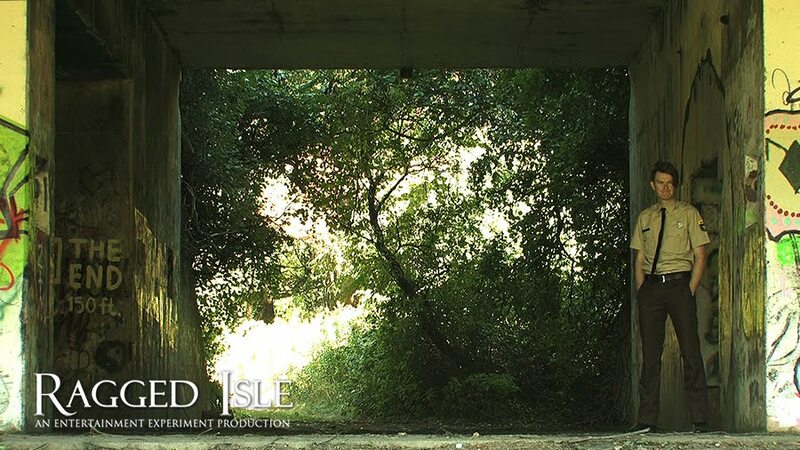 Plus, yesterday I got to see a rough cut of that teaser trailer Barry has promised, so I'm really feeling the "Ragged Isle" love today. 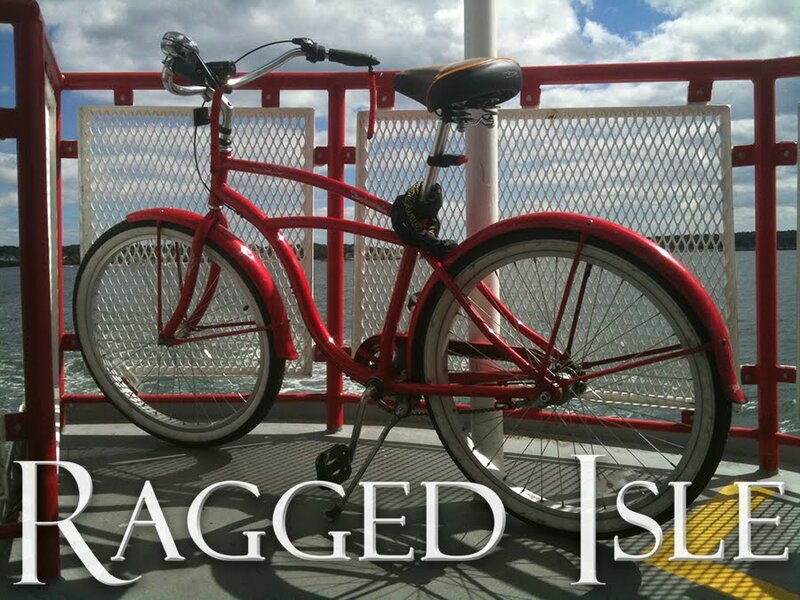 Ragged Isle rolls on. I am here to assure everyone of that. 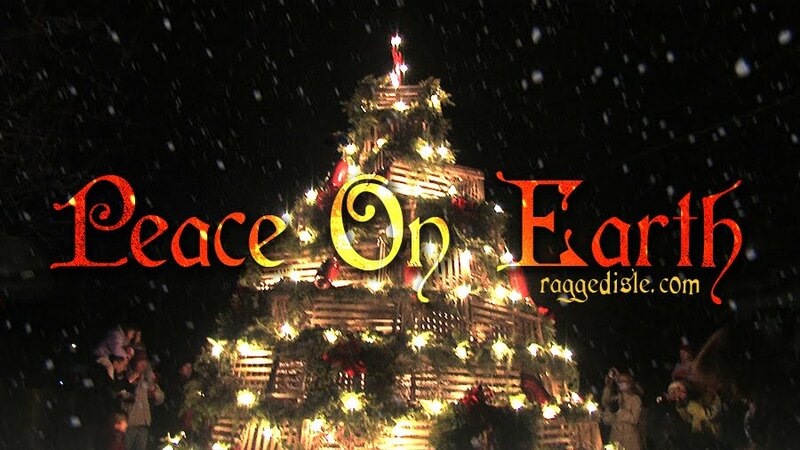 It will be a lengthy post-production but it should be ready by January or February. 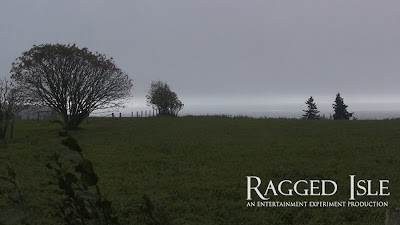 There will be, for sure, a teaser by Halloween and we are hoping to get some more stuff going to keep things interesting. 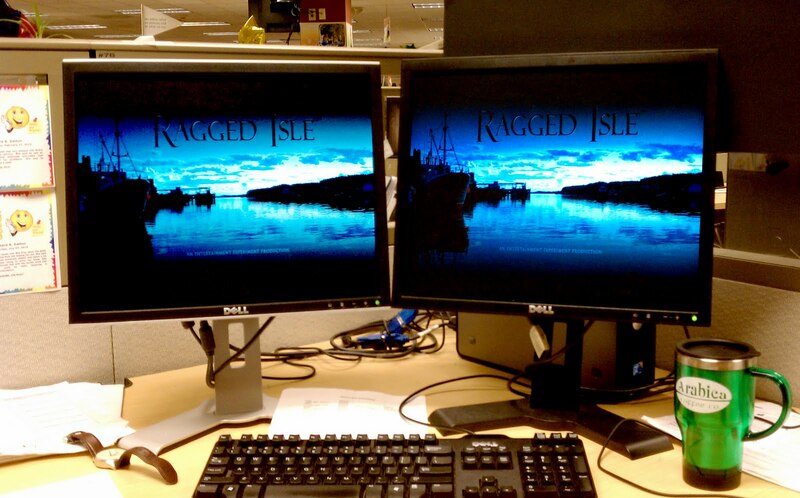 If anyone has any photos, poetry or whatever related to Ragged Isle let us know. We are in the process of getting the website in a more complete and compelling space and are looking for some more content. Barry has been an editing maniac so a huge and heartfelt thank you to him. Working on the talent show episode tonight and all I can say is that I love this project, I love the story, I love the characters, I love the locations, I love it all. Wow. Just you wait. Not too shabby. Tons and tons and tons of footage was captured this summer and I've been moving my way through it, compartmentalizing and starting to arrange scenes. 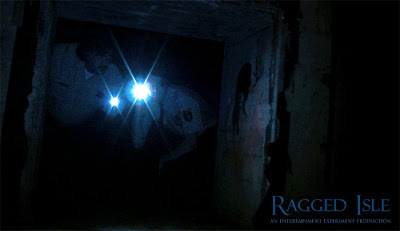 If you are anxious to see the series, believe me I am too. 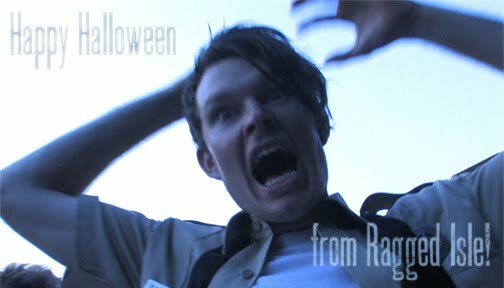 Maybe we'll even have a new teaser trailer by Halloween! Uh oh... I just said it. No we have to some how make it happen. Barry showed me a few scenes he's started to cut together. He warned me beforehand: "You need to know, this isn't going to look like what you're picturing in your head. 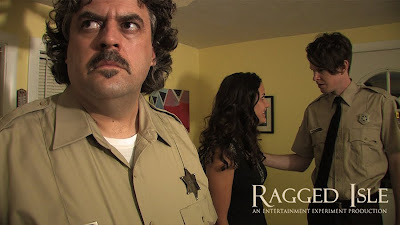 These scenes are very rough, very raw." But you know what? They looked awesome! You may have heard of The 48 Hour Film Project, a multi-city filmmaking competition in which crews are asked to write, shoot, edit, and score a short film in just 48 hours. The local Best Film winner this year was MINT Films' marvelously cheeky western, "A Bounty For Susannah," which stars "Ragged Isle" players Ian Carlsen, Erik Moody, and Meghan Benton. Watching the short, it's amazing to contemplate what they accomplished in just 48 hours. It really is incredible. But this week, I've also been thinking about what Barry and Karen accomplished in just two months. 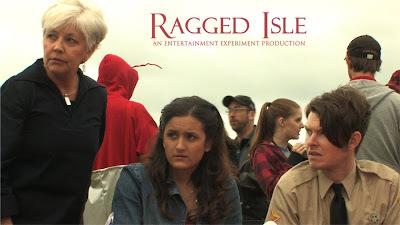 Principal photography for the first season of "Ragged Isle" began on July 28 and wrapped up on September 26. 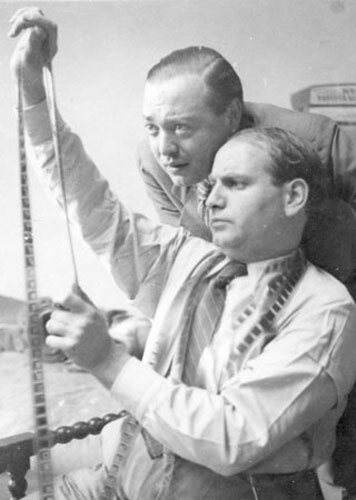 In that time, Barry (with plenty of help from assistant director Karen) shot ten episodes -- basically ten separate short films, each with multiple characters, scenes, and locations, and with continuity concerns to contend with between each film. Yes, the scripts were written before shooting began, and yes, Barry can edit the episodes at his leisure. But still, man, that's an amazing achievement. Way to go! Tonight's the night. 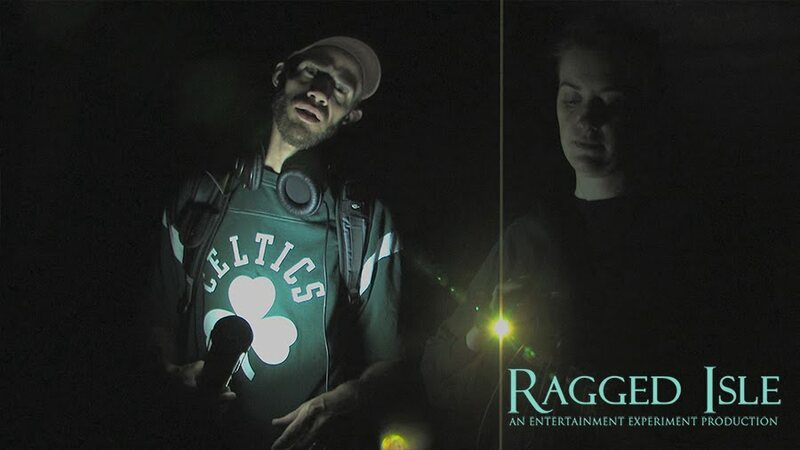 It's been a crazy summer for all involved with Ragged Isle and tonight is the final official shoot night scheduled. 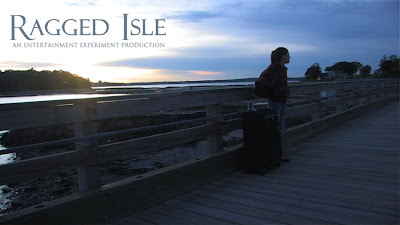 Sure I may have a couple pick up shots to get and I already know that we will need some serious ADR sessions and color timing before the public gets their hands on our series but it's still tough to think that this is officially the end of our Summer on Ragged Isle. If it doesn't rain in the next hour I'll probably go take a walk down to Shaw Park where a few of us shot some key scenes and take in the atmosphere one last time before all the green is gone on the trees. 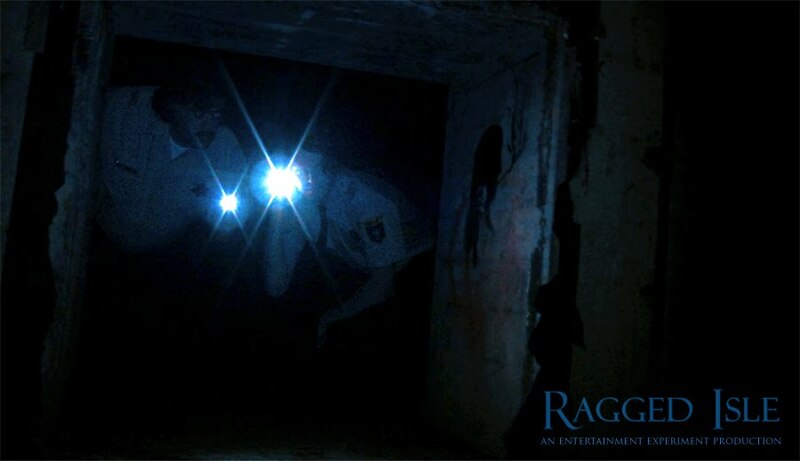 Luckily, we've got all this footage to revisit. As my memory fades over the years, I'll thankfully always remember this summer and all the wonderful friends who shared it with me. 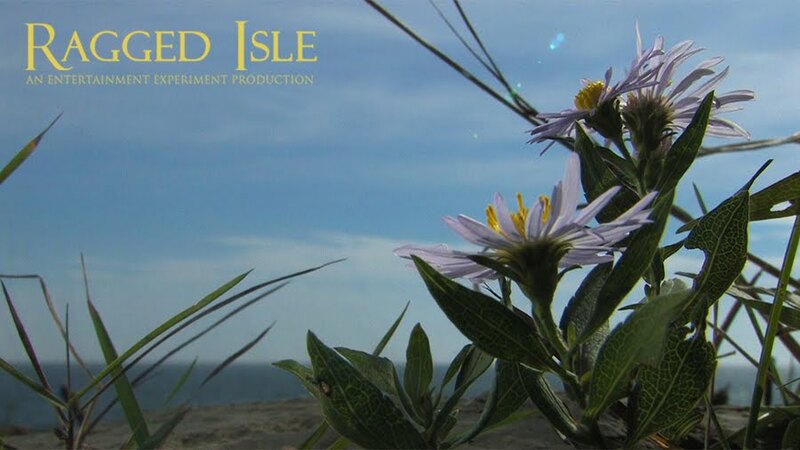 Last day of principal photography this Sunday! 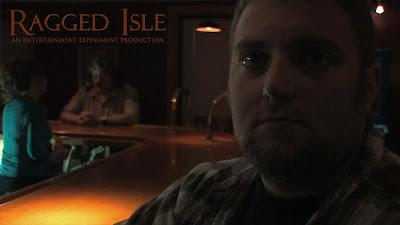 Tonight was my final shoot for Ragged Isle for Season One. We went out to Great Diamond, which was brief but beautiful and then to Mike's driveway for the rest. I am feeling tired, sad, excited, stunned, warmed, happy, empty, depressed, proud, and some other crap. After the shoot I drove home listening to my pump 'em up (get excited and also calmed for shoots) song, Sinead O'Connor's "No Man's Woman," and cried no less than four times. I will miss all of you incredible people. Thank you so very much for being a part of this and giving so much of yourselves over to this project. Thank you. We love you. 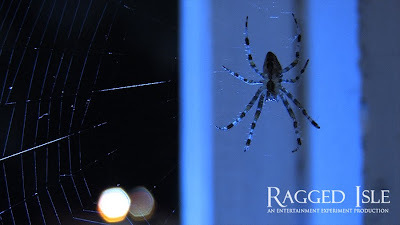 Here's a few images that caught my eye as I was going through footage this evening. Thought I'd share. Enjoy! Today we got to spend some time shooting in the woods. 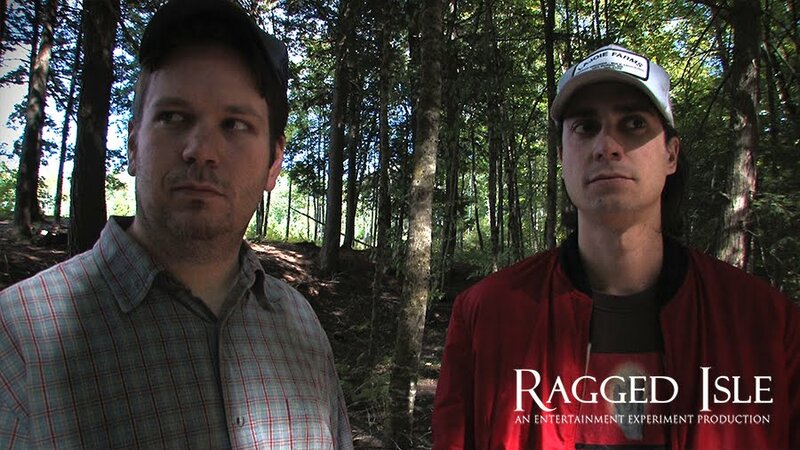 As we were getting down to the last few shots, I had a sudden rush of flashbacks to a series of horror videos I shot as a kid with an old friend of mine Robert Dakin. He was known around school for being a video wiz and had made a series of scary slasher shorts called "Murders on Swan Lake." 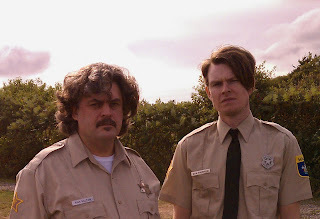 I met him in middle school and came with my own experience in home video "filmmaking." I remember our families even had the exact same video camera. 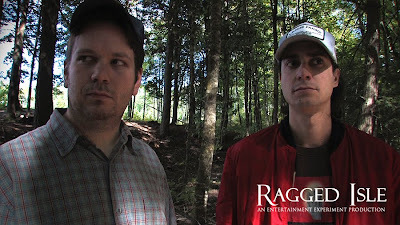 We hit it off right away and began working on a trilogy of short films called "Shadows in the Woods." As I knelt down in the woods today and recorded Ian, Michael, Doug, and Dominic exploring the forest, I was a kid again. Wasn't expecting that today. Nice surprise. So many times over the course of this summer's many "Ragged Isle" shoots, Barry or Karen (or both) said to me: "What were we thinking? ", or sometimes: "What were you thinking? ", and once even: "I want to poke you with a pencil! ", all because of the ambitious, complicated, ridiculously elaborate scenarios we came up with at the script stage -- easy enough to write, but enormously difficult to execute. 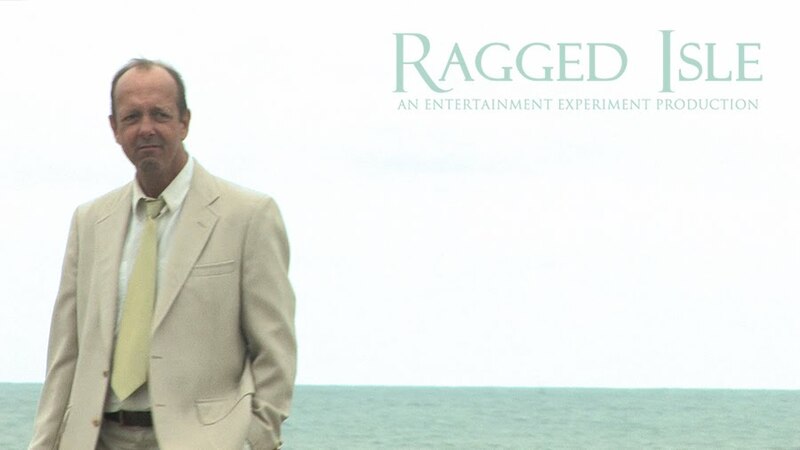 But it was Barry and Karen who conceived of and wrote what is perhaps the most ambitious, most complicated episode of the season, the Ragged Isle talent show episode. And thank God they did, because today we got to watch the comedy stylings of See Bass, the magical prowess of Louis Gilbert, the dance chops of Paul and Eric, and the most romantic duet I've ever seen. Wow, what an amazing day. What an amazing episode. Can't wait to see this cut together. We have been shopping, crafting, shot list arranging, communicating, and cat yelling. Damien, our adorable, black kitten loves everything about the decorations for tomorrow. He loves how they taste, how they slide across the floor, how they are easy to carry in his mouth to show Daddy, and how comfy they are to sleep on. This has made the prep. process frustrating but really cute. Through all our shopping today we had to come up with a color scheme, which became gold with a side of gold and a splash of red and blue. Tomorrow, Geno's will shine like Liberace's living room and should set the stage for some really unique entertainment. Ragged Isle is going hideous fabulous and we'll all love it! 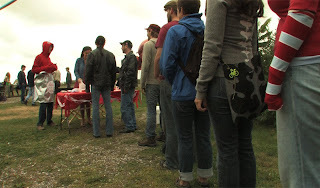 We've put out the call one last time for our awesome extras. This Sunday is the last chance we have to enjoy their company and include them in our adventure. I have enjoyed being around all these great people and I only wish I could spend more time on the set to talk with all of them and learn their stories. 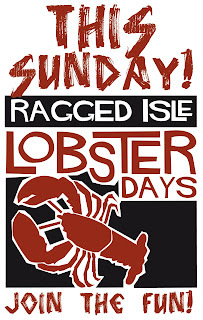 If you do stop by this Sunday and join in the extra fun please track me down and say hello. I'm so very honored that you have given us your valuable time. 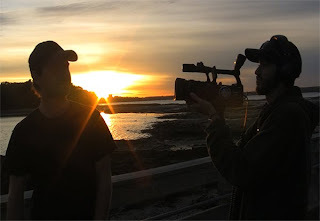 We took Erik and Rick out to Peaks Island this morning to shoot a quick scene in front of the Sheriff's house but found plenty of time for extra exploring on the island! We've got lots of great new images up over at our facebook page. 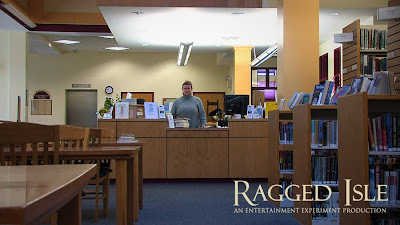 You should stop by and check em out. There's a whole folder there full of photos taken by our friend Judy Beedle. Like what you see? 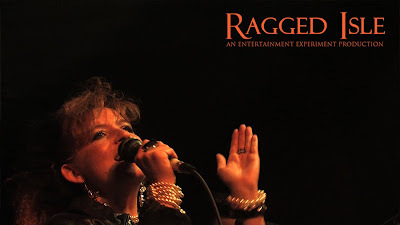 She's got a website full of great imagery for you to explore. Go get it! 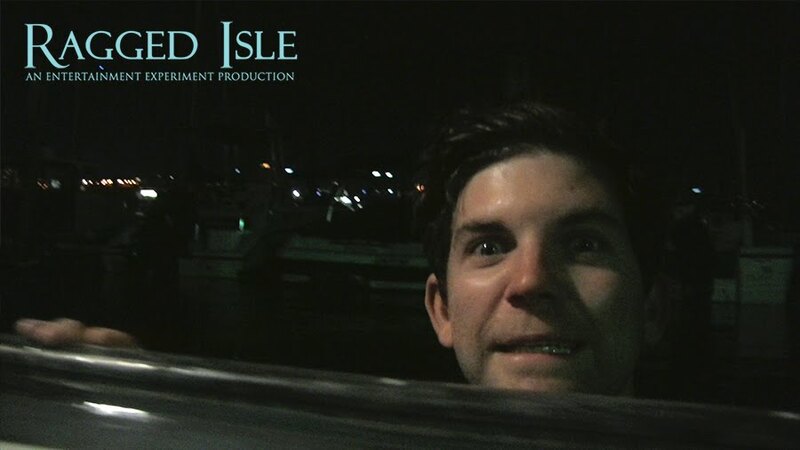 Trouble's a brewing... Is the Island's only protection prepared for what awaits? 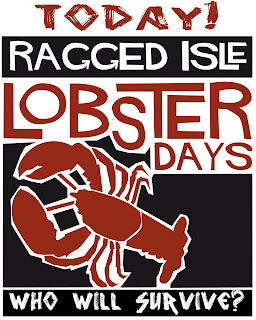 So many secrets were shot today at Ragged Isle Lobster Days. It's hard to not spoil the surprise but here a few images that might whet your appetite. Thank you to the gang of extras we had today for the shoot. 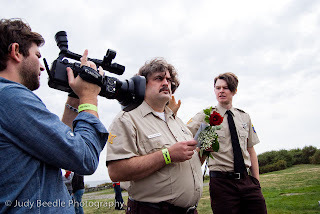 You folks are all over the footage and totally made the fest feel real. I can't wait for you all to see this one but unfortunately, it's the season finale, so we'll all forget this day ever happened before this footage shows up again. Thanks a million everybody! I headed down to Two Lights Park early, planning on getting there well before the actors to help with set-up. But a mis-read Mapquest direction sent me right instead of left a few miles from the park, and then when I stopped at a roadside vegetable stand to get my bearings, my car refused to start up again. So, I called Barry, who was still reeling from problems of his own. 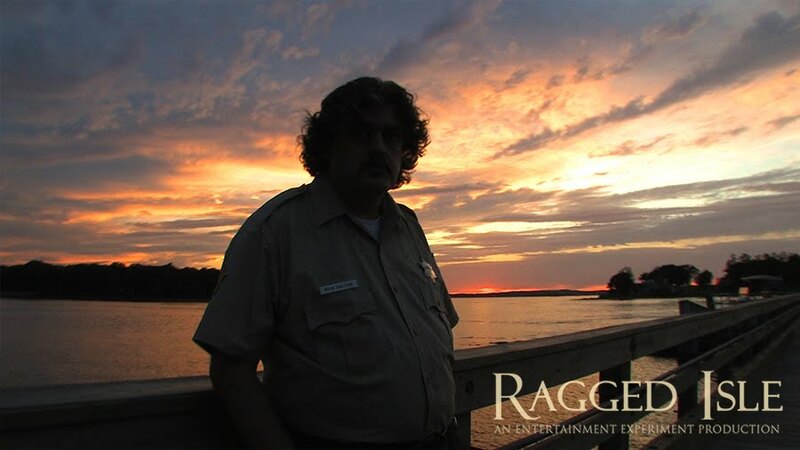 A ranger had told Barry and Karen upon their arrival that they didn't have the proper permits to shoot at the park. 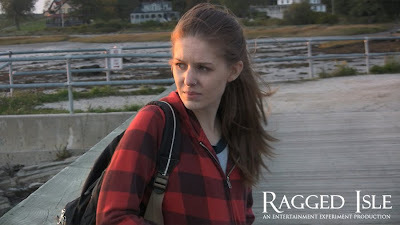 After a full-blown (and fully warranted) panic set in, the ranger returned with a waiver for Karen to sign, absolving the park of any responsibility if anybody was hurt during the shoot. Barry dispatched Torrey to come get me. I told him I was just down the street from the park at 82 Spurwink Road. What I neglected to tell him was that I was in Scarborough, not Cape Elizabeth. So Torrey's GPS guided him to a place where I was not. And by the time Torrey arrived, my car had mysteriously healed itself, starting up fine and continuing to run without a hitch for the rest of the day. All of which is to say that there was plenty of tension in the air before the shoot even started. However, Barry and Karen's ceaseless professionalism, combined with the good humor and enthusiasm of the cast (including all our fabulous extras), carried the day. 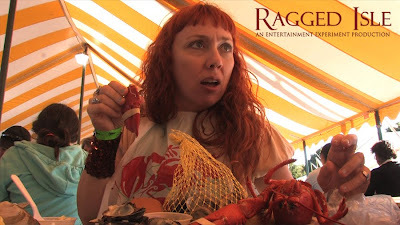 Hey, Barry: We just shot the lobster festival scene. 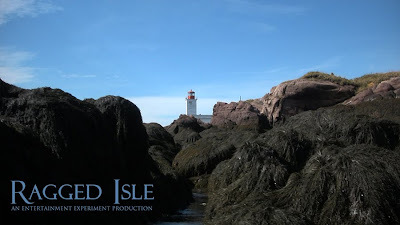 Karen and I spent some time wandering around the location we will be shooting at tomorrow for Ragged Isle Lobster Days. The location is called Two Lights State Park and it's lovely. As we sat on the rocky coastline there were moments when it truly felt like we were on an island. I hope that the 30 or so folks that come out to help us shoot tomorrow spend some time exploring the park when they are done with us. It's truly a delightful spot and I know that Karen and I will be back many times in the future. One of the blessings of working on this series has been seeing all kinds of new and interesting points around southern Maine. I am so glad we decided to do this project for so many reasons. Today, it's because of Two Lights. Are you going to the Ragged Isle lobster festival this Sunday? If not, why not?